At the end of the 1970s, the japanese Big Four all had custom models. But these models were little more than hasty remodeling of existing designs with cowhorn handlebars and tear-drop tanks. 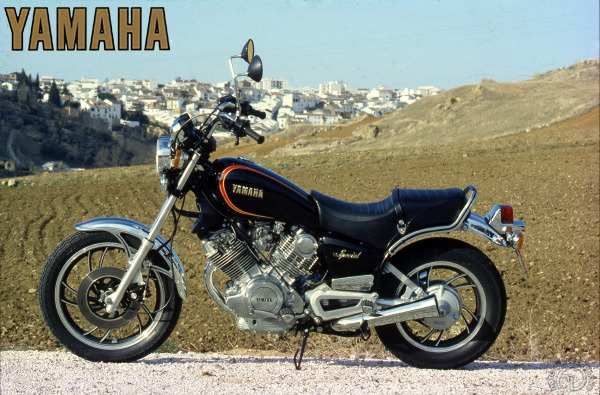 Yamaha was the first to launch - in 1980 - a properly thought-out concept for the US market, that is to say a big V-twin. In fact, the company tried to hit the headlines twice with the launch of its first V-twins and put both this XV 750 Custom and the 1000 TRl -intended as a classic European roadster-on the market simultaneously. Europe criticized the XV for not having precise roadholding as more classic motorcycles. Nevertheless, this model succeeded in creating a personality for itself, and almost fifteen years after its launch, its descendants are still among the best of the category. Inspired stylistically as well as for its riding position by Americans, it is nearer to the Italian Guzzi in regards to its torque-laden engine, while it has inherited all the traditional japanese qualities of cleanliness, attention to detail and mechanical sweetness. The narrow V-twin power unit is suspended beneath a pressed-steel spine with cantilever rear suspension. Its oleopneumatic damper has the agreeable feature of being quickly adjustable by an easily-accessible knob under the saddle; a valve allows the internal pressure to be varied between 7 and 56 lb/sq in. XV 750 is quite pleasant and fun to ride, but despite its technical sophistication, it rides poorly on badly-surfaced roads . The Yamaba XV 750 was japan's first attempt at a custom V-twin and proved remarkably successful. Motorcycle encyclopedia Moto Passion, realised by François-Marie Dumas, include almost 2000 photos presented with an exhaustive history of the motorcycles exhibited. High resolution scans or original documents presented and signed with my name. Please contact me at info@moto-collection.org for conditions and copyright.